What are spreader bars and are they necessary? How can I install posts? Is it possible to sleep in a hammock overnight? How can I hang a hammock chair if I have one? Have you ever experienced the feeling of lying in a camping hammock, enjoying the fresh atmosphere of a beautiful camping day? Trust me; it will be one of the most memorable moments in your whole camping life. Today, I will give you an ultimate guide to choosing the best camping hammocks. Now, let’s get into details about this amazing sling. You can think of a hammock as a sign of relaxation, summer, leisure, and easy living. In details, a hammock is just a sling which is made of rope, fabric, netting and hang between 2 points. Overall, the main purpose of using it is to swing, sleep, and rest. A hammock simply has a woven network of thin rope twine or cloth panels stretched with ropes between trees and poles. This amazing furniture serves a lot of different purposes, but it’s best-known for great comfort and relaxation. That’s the reason why a lot of campers choose them as a lightweight bed on their camping trips. The ground is hard, so if you have problems sleeping on it, you will find your camping trip terrible. If you are going to get off the ground with a hammock, you can probably rest comfortably at night. Besides, with a hammock, you will feel as shielded as sleeping in a tent. Have you ever awoken in the middle of the night in your tent because of spiders or bugs? Well, with a backpacking hammock, you will sleep above the ground. Therefore, creepy-crawlies will not have much chance to approach you while you’re sleeping peacefully. When you decide to go camping, I’m pretty sure that you want to be outdoors, breathing some fresh air. Why do you have to shut yourself inside a tent? You can enjoy the clean and cool night air while you’re sleeping in a hammock. With a hammock, you can sleep anywhere you want as long as there are trees, poles or any anchor points to hang it. Therefore, you won’t have to worry about rocky ground or finding flat ground to sleep on. If you are too concerned with backpacking, you will know that it’s quite challenging to choose the right tent. In fact, many of us have to secure tents to the outside of our packs as they take up a lot of space in there. However, you can easily pair a cheap hammock with a tarp and some rope. This way, you can make for less room and less weight taken up while you can get most of the protection of using a tent. It’s possible to match and mix your favorite parts from different hammocks together, which is a huge advantage over tents. When it comes to finding the best camping hammocks, there are three main types of hammocks available for you to choose from. Depending on how you want to use them, you can choose the right one. This type is very resistant, therefore, very durable. A parachute nylon hammock has a bit of stretch which makes them so comfortable. You will find it very comfortable to sleep with this one in a row. These one are compact and made out of very light materials. You can use them for a fast or lightweight hiking trip. Remember that when you cut weight, you may lose your comfort. They are made out of high-end materials and therefore, providing the maximum protection while you’re on a backpacking expedition. They also come with different accessories like a rain fly, extra guy-lines, and a mosquito net. There are only two main materials: cotton and nylon. Cotton: Hammocks made out of cotton are more attractive due to the weave. But they are likely to be bulky, heavy, and sometimes, attract water, thus, offering a poor performance in wet weather. Nylon: Nylon hammocks seem to be a better way to go for when it comes to camping. This is because they are smaller, lighter, and can repel water, hence, offering great performance even in bad weather. The width and length of your hammock will be all up to your personal preferences. If you are alone, then a hammock which is too wide or too long is a bad choice. It can wrap around you, and you will feel claustrophobic somehow. However, if you are tall, then go for one that is about 8 feet long. Remember to consider your body weight and the maximum weight capacity of a hammock before buying it. In fact, several large models suit heavy and tall people. Also, you can go for a double model if you want to share it with a partner. More importantly, never load your hammock with more than the maximum weight capacity. Or else, this will reduce its lifespan and be also potentially dangerous for you. There are various suspension systems out there but to put it simply, they are just a combination of carabiners and straps. However, some products do not include these, therefore, remember to check this out carefully before you head to the mountains. The longer the straps are, the more attachment points your hammock has and of course, the better. These long straps will give you more flexibility as they can easily work with different types of trees. Almost every hammock is made with breathable nylon material so that it can keep the camper cool during hot summer days. But if you are going to use it in chilly weather, then look at the insulation. In details, some hammocks come with handy accessories such as top quilts, under quilts, or sleeping pads. Now, all you have to do is consider the weather you will probably face and choose what you need. There are a few accessories or a hammock which may come in handy, depending on the location you are camping. In my experiences, an integrated mosquito net is a good idea if you plan to camp in a buggy area. Besides, if it is going to rain in your campsite, then go for a rainfly. I also recommend you guys get a little bigger model and one that you can attach to the ground. Therefore, you can keep yourself dry and won’t have to worry about the rain coming with side winds. Comfort: Remember to choose one that allows you to rest comfortably because this is the first criterion you want to fulfill when buying a camping hammock. Versatility: A good hammock should not only serve as a bed but also help the user relax while we’re doing something like watching TV. Straps: Once you choose a hammock, you will obviously need to secure the best straps firmly to poles and trees. These straps should have excellent strength to support your bodyweight while tied to 2 anchor points. Cost: It is a stupid idea to spend too much on a hammock. If you want to use it that much, then spend more and also, make sure it can get a lot of use over the years. Ease of use: Last but not least, a good hammock is the one that you can setup without effort. In other words, if you have to fumble around and struggle to do that, then that hammock is not a good one. Also, choose a hammock with long cords and high-quality carabiners, so that you will have the flexibility to setup that bed. 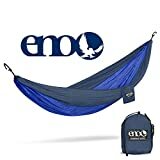 Eagles Nest Outfitters – DoubleNest Hammock is one of the best camping hammocks. This product is very lightweight, compact and it can easily fit into your small bag. Therefore, you can store it even in a rucksack. With this double hammock, you can share the comfort and accommodation with your partner in rough conditions. This hammock is one of the most comfortable ones with breathable nylon taffeta supported by triple interlocking stitching. It can also support a 400-lbs person at most. However, the nylon fabric is extremely smooth. It offers tremendous durability in any weather situation. Normally, it’s pretty easy for you to clean up the hammock using warm water and soap, without any chemical-based detergent. Also, it is still necessary for you to avoid using this hammock during snowfalls as cleaning the fabric will be tough. For me, you can use this amazing product not only for sleeping but also for your casual activities. For examples, you can relax your body lying in this hammock while reading a book or watching TV. Besides, trust me, your kids will get interesting in this one as they can jump and bounce in their playtime easily. Good for: heavy and enthusiast campers. Easy to use, setup, carry, pack, tear-down, etc. Side pocket or stuff sack, great for wallet, phone, etc. Overall, this grand truck double is comfortable, light, spacious. One of the best things I like about it is that it is quite cheaper than other opponents. It also comes at a reasonable price. With this product, you will get all the carabiners and cords needed to set it up quickly. In details, this item offers you the great suspension system which is not always available in a camping hammock. While this hammock is hung up in the air, the stuff sack doubles and serves as a storage pocket. Therefore, you can store your headlamp, phone, flip flops or a book at the same time. The hammock is a wide, long and constructed solidly. More importantly, it has enough room for two people if they weigh about 300lbs in total. Thus, you and your partner, of course, if not so heavy, can sit in this hammock without the system falling. This item also features flaps on the edges that can close over the top at night to block out the light. This way, it can protect you from disturbing bugs. The downside of this item is that it requires a tarp over the top as it’s not waterproof. However, if you are not too heavy and looking for a bed for backpacking or car camping, then choose this item. Good for: light sleepers who enjoy backpacking and car camping. Carabiners are quite heavy, need to swap out. 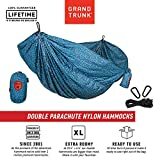 If you are a dedicated hammock camper who wants an all-in-one package, then this is not a bad idea. But what makes this Hennessy special exactly? Well, with a built-in bug net, included tarp and ridge line, this product provides everything you need to start your camping trip. It is spacious and has an asymmetrical design which makes it easy to get a flat lay. In details, it has a maximum weight capacity of about 250lbs, a bit lower than other products, but still generally fine. The built-in bug net will bring you great protection from bugs. However, it is fixed so you can’t remove it and it’s almost impossible for you to get an unobstructed view of beautiful stars. Honestly, this is what I hate the most about the hammock. The hammock is made of the most durable and toughest fabric. This fabric is burly, and it will be a perfect addition if there is any snow or rain. You can use this one with a rain fly. However, it comes with its suspension system. Specifically, a friction knot and small plastic clip will make it’s quite hard to set up the rain fly. Good for: beginner backpackers who look for an all-in-one hammock. This is also one of the best camping hammocks for you to choose. It provides great comfort, durability, and versatility. It provides you all in one nylon stuff sack doubling as a gear bag. If you plan to head out for an overnight camping trip, then this is not a bad choice. This Neolite is lightweight, and you can set it up very quickly. Additionally, the travel backpacking hammock is quite spacious so that it can accommodate two people comfortably. This is due to the high strength, parachute nylon which is not only fast drying but also breathable. Additionally, this product includes accessories that can help you set up and tack back down the hammock in no time. The only downside of this item is that it’s quite expensive as compared to others. However, it will be worth your money as it excels in all categories. Good for: any camper who is not on a budget. Lawson Hammock Blue Ridge Camping Hammock is one of my favorite hammocks by far. This is primarily because it is very comfortable. Especially, I can use it on the ground as a normal tent when there is no tree and pole. I once tried using this one in a mosquito infested area and also in severe weather condition like a storm. The result was unbelievable when I did not get bit or wet at all. Also, with this one, you can pack it on the bottom of your backpack, and it can fit perfectly there. In fact, it just takes you a few minutes to set up this one, much faster than any tent or most other hammocks. If you are a side sleeper, then this is a good choice for you when it is more spread out and pretty tight. The sleeping pad can also work well with this hammock. Additionally, because the fabric is flat, the pad won’t curl up as they usually do with gathered end hammocks. 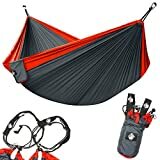 Good for: single campers looking for an all-in-one hammock for and selective backpacking and base camping trips. The tent poles and spreader bars put it on the heavy side. They are wood planks which help your hammock open and the bed flat. Poolside and rope hammocks have these parts, giving them a classic look. With these bars, your hammock is likely to tip. A lot of people prefer the art of balance, but honestly, having them or not is just a matter of your preferences. These beds have different weight capacities. However, a hammock can hold one heavy adult at least. No, they can’t, but remember to consider buying tree-safe hanging accessories. Wooden or metal posts are a permanent and solid solution to having a hammock hung. You need to bury two poles to a depth of 1.5 and 2 feet and then cement them in place following the instructions on the package. Hammocks are best for sleeping overnight, particularly products which are tolerant of sleep movement. A lot of campers all over the world sleep in their hammocks overnight, some even use hammocks as beds for years. Well, you just need to choose a heavy tree limb or solid beam. After that, test the capacity to know if it can hold a large amount of weight. Have you figured out how to choose one of the best camping hammocks for your next camping trips? Well, honestly, there are quite a lot of things to consider. However, if you understand all the main purposes of hammocks and figure out your preferences, choosing the right one is not that hard. Hopefully, you guys enjoyed my article and found my buying guide helpful for your camping experiences.